Race day already? You'd better start getting ready... it takes years of excruciating work, training day in, day out for thousands of hours and, most importantly, you have to know how to ride a horse. You've sort of waited until the last minute on this thing, we hope you're ready to be in the Kentucky Derby, it's kind of a big deal. People bust out those huge hats for this! 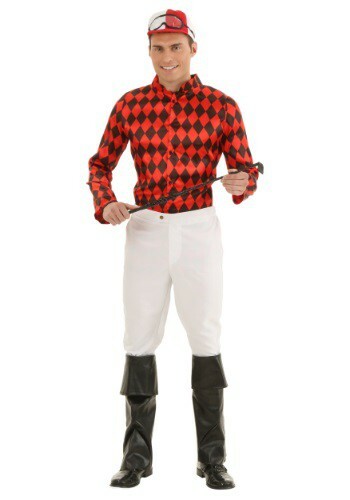 While we can't help you with the horse riding skills, we can totally get this Horse Jockey Costume to you so you at least LOOK the part. If you happen to win the race, don't forget to have a mint julep and say a toast and thank HalloweenCostumes.com for helping you absurdly win the biggest equestrian event in the world!